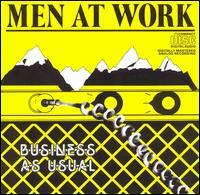 Business as Usual is the first album by Australian band Men at Work, released in 1982. The Australian release of the album included a black and white cover design, whereas overseas releases had the same design but in yellow and black colour scheme. 11. "Crazy (Non LP B-Side)"
13. "Who Can It Be Now? (Live)"
14. "F-19 (Non LP B-Side)"